The constant monitoring of the process of acquisition and management of fundings for training provides concrete results. Access to financing is an operation that needs to be managed at his best to deliver concrete results. Govern efficiently and effectively this process requires specialized knowledge and skills. SOGES Funding for Training values experiences, relationships and distinctive skills to identify the more appropriate funding lines, to allow access to dedicated resources, ensure the success of approved projects and to ensure the obtaining of the assistance granted, besides to manage and keep under constant review all sorts of informations and needs concerning the training (deadlines, skills, costs, statements of account ...). Quality, transparency and reliability. These are the characteristics that mark our mutual relationship with the major Italian players in the landscape of Regional, National and European Interprofessional Funds. 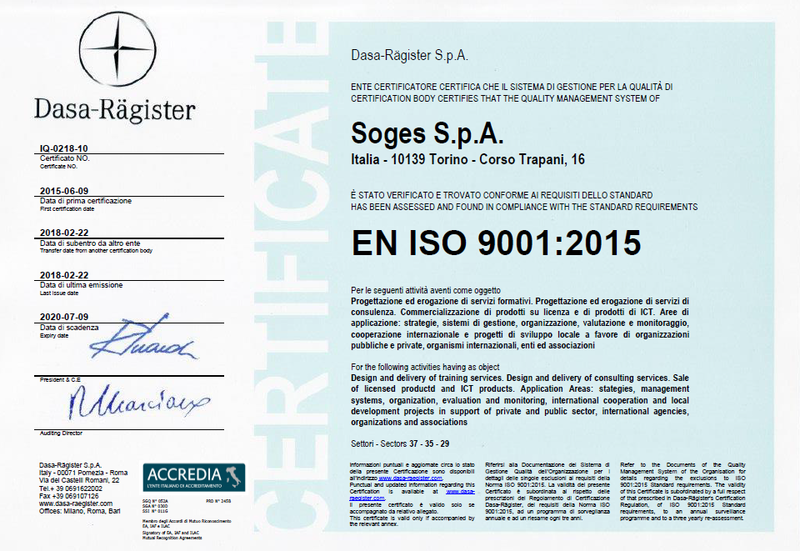 These features have also brought SOGES to receive certification of Accredited Company for Continuing Education at the Piedmont Region and at the Veneto Region. Call to action: Simplify your future. Contact us!